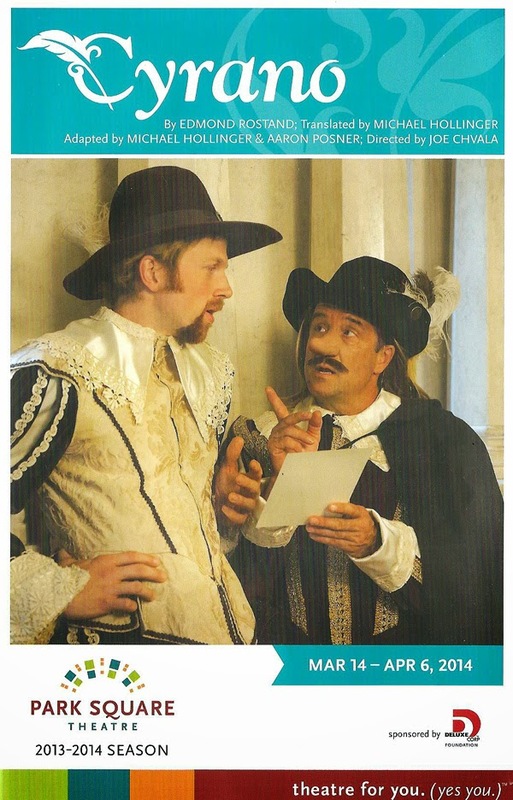 The story of Cyrano de Bergerac is one everyone knows, even if you haven't seen one of the many dramatic interpretations of this 17th Century French poet's life. Despite being familiar with the story (Cyrano is in love with Roxane but fears that she could never love him back because of his unusually large nose, so he agrees to supply the poetic words of love to the handsome Christian that cause Roxane to fall in love with him), I hadn't seen the play before last year (although I have seen the 1987 Steve Martin/Daryl Hannah flick Roxanne, if that counts). Bradley Greenwald's musicalized translation of the original late 19th Century play, presented as part of Theater Latte Da's new work initiative last year, was my first exposure to the full story. Park Square Theatre is currently presenting another new-ish translation by Michael Hollinger, and with a fantastic cast, impressive set, and "immediate, rhythmic, and lively" language (as the playwright himself notes in the program), it's a wonderful interpretation of this story that is a great mix of comedy and tragedy. There's a feeling of a-play-within-a-play as actors wander on stage before the show begins and start prepping, dressing, and adjusting wigs. The character of Le Bret (Shawn Hamilton) functions as a sort of narrator, setting the stage and introducing characters. Cyrano (J.C. Cutler) and Christian (Sam Bardwell) are soldiers in the same regiment, the former known for his skill with words and the sword, and the latter a bit of an unknown as newcomer to the regiment. Cyrano is in love with his beautiful cousin Roxane (Emily Gunyou Halaas), so when she tells him that she loves the handsome Christian, he agrees to look out for him. Unbeknownst to Roxane, he also agrees to write letters to her from Christian, who is not blessed with the gift of poetry as Cyrano is. Roxane continues to fall in love with Christian through his (Cyrano's) letters, culminating in a lovely balcony scene reminiscent of Romeo and Juliet. The second act sees Cyrano and Christian going off to war, with Roxane in pursuit, unable to be parted from her love. When she tells Christian that she loves him for his soul, and would love him even if he were ugly, he realizes that it's Cyrano she truly loves, not him. It's a tragically bittersweet ending, as truths are revealed too late. There are many reasons to see this show, but the number one reason is J.C. Cutler's beautiful and nuanced performance as the titular hero. His impressive talent (see also last season's Red) is a perfect fit for Cyrano; he's everything you want Cyrano to be. His voice is loud and commanding or soft and gentle, he's smart and witty, an ace swordsman, and speaks entrancing words of love. It's easy to see why Roxane falls in love with him, albeit unknowingly. The always great Emily Gunyou Halaas is a Roxane worthy of his affections, smart and spirited. Sam Bardwell is perfectly charming as Christian; even though he may not be able to put words together very well, there are still plenty of reasons to love him, and you almost wish that Roxane could see and love him for who he really is. This wonderful cast of nine seems much larger, as everyone except for J.C. plays multiple roles, quickly coming and going from the stage with dizzying speed. Of special note are Jon Andrew Hegge and Craig Johnson who each create such different characters they're almost unrecognizable from one to the other, with fast and fantastic costume changes happening backstage. Jon transforms from the town drunk to the kindly nun, and Craig from the theater owner to Roxane's over-protective and fluttery pastry-loving nurse, and several characters in between. When the director is also a choreographer as Joe Chvala is, you know that movement is going to be an interesting and integral part of the show, as it is here. One example is Cyrano's famous battle against 100 thugs, which is a delight to watch (with fight choreography by Annie Enneking). The period costumes (by Matthew J. LeFebvre) are gorgeous, from Roxane's flouncy dresses to the men in tall boots and capes. The set (by Robin McIntyre) is dominated by two large set pieces with stairs and a balconies that move and turn to create different shapes and spaces on stage. Lastly, there are also a few musical interludes that feel organic and are quite fun and lovely. Cyrano is many things in one play - great comedy, a tragically beautiful love story, sword fights and epic battles, and beautifully poetic language. This impressive production is playing at Park Square Theatre now through April 6.